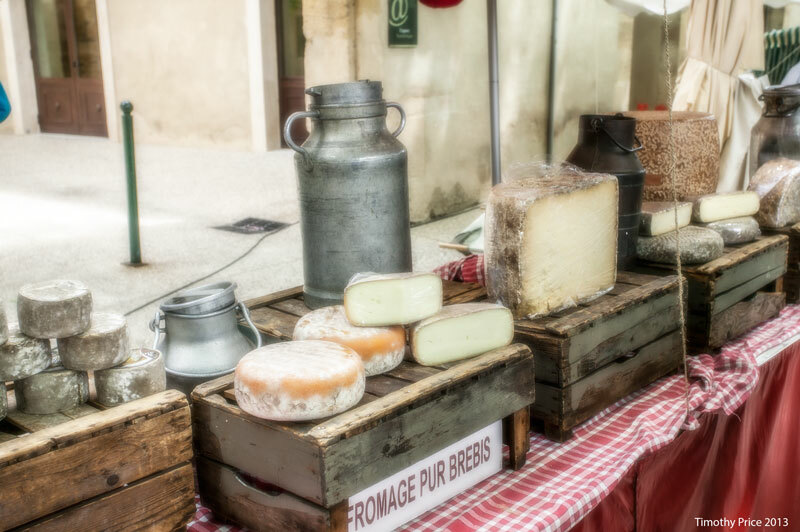 We took the long road to Avignon and visited the market at Lourmarin where we got cheese, meat and bread to eat along the way. The large, half round of cheese in the first photo is Cantal. We have a recipe that calls for cantal, but I couldn’t find it in Albuquerque. 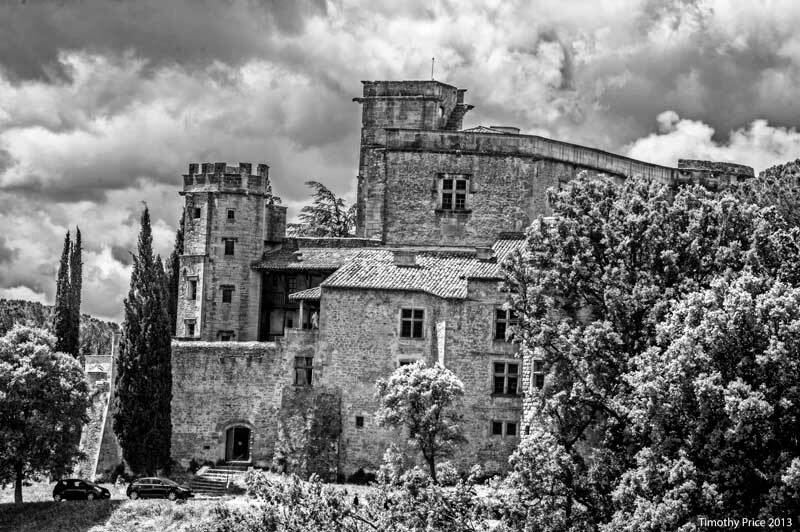 There is a castle in Lourmarin as well. Then we drove to Bonnieux, a picturesque 12th century village built on a hill. 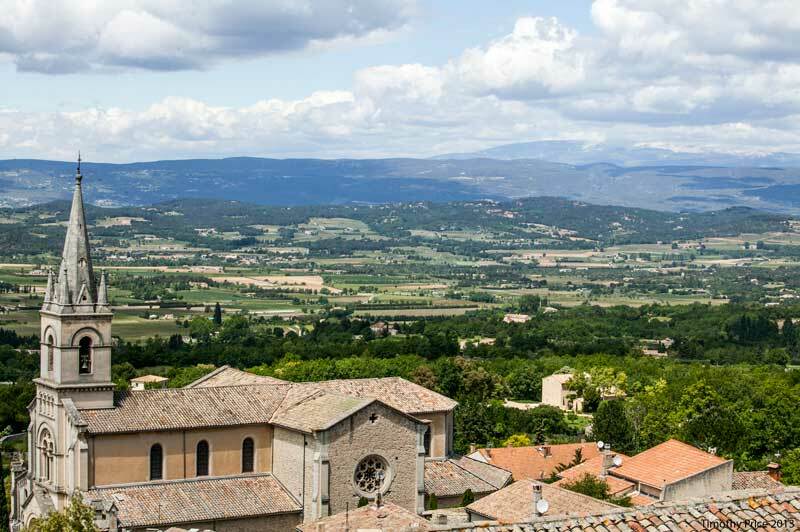 The photo with the church in the foreground shows Mont Ventoux in the background. 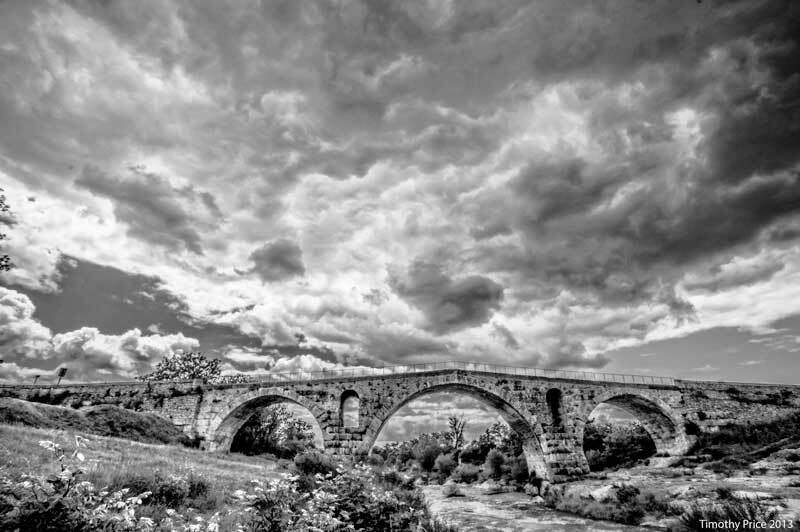 We passed by an old bridge that was probably either Visigoth or Roman on our way to Roussillon. 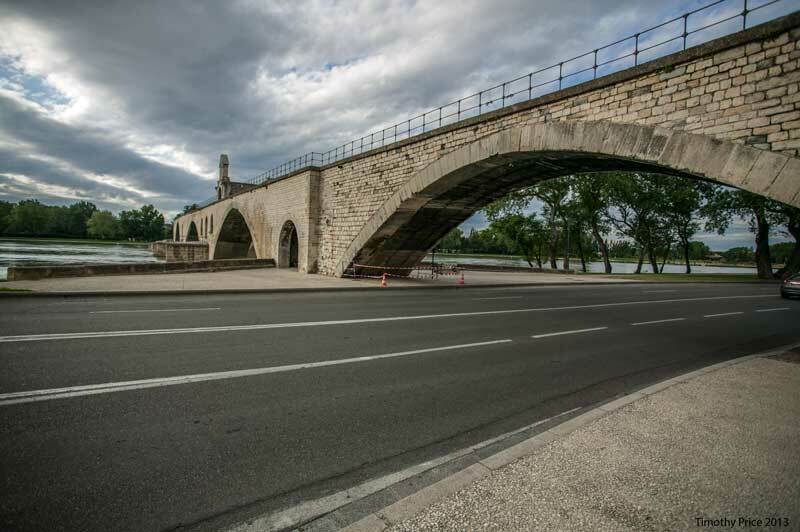 There is a similar bridge in northern Spain that is Visigoth. 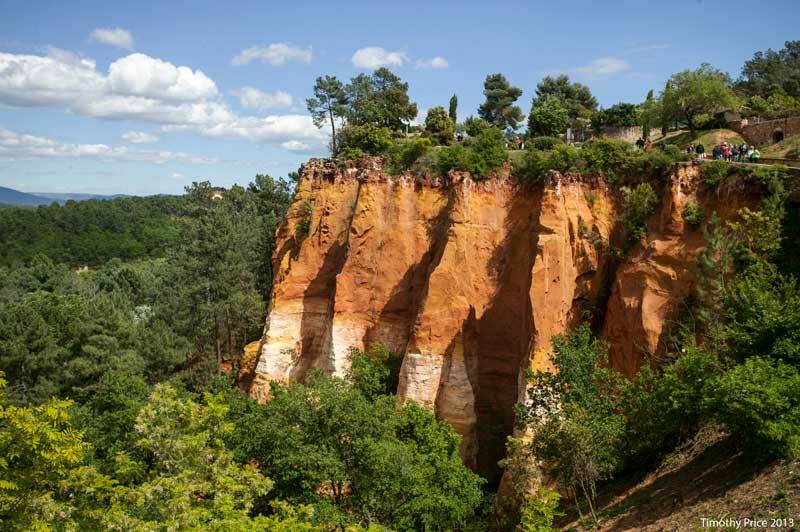 Roussillon is painted with the red and yellow pigments they make from the soil in the area. We ate lunch on a bench in an area protected from the wind and watched the light change on Mont Ventoux in the distance. You can tour the valley and the operation for making the pigments, but it was cold and windy so we didn’t do the tour. 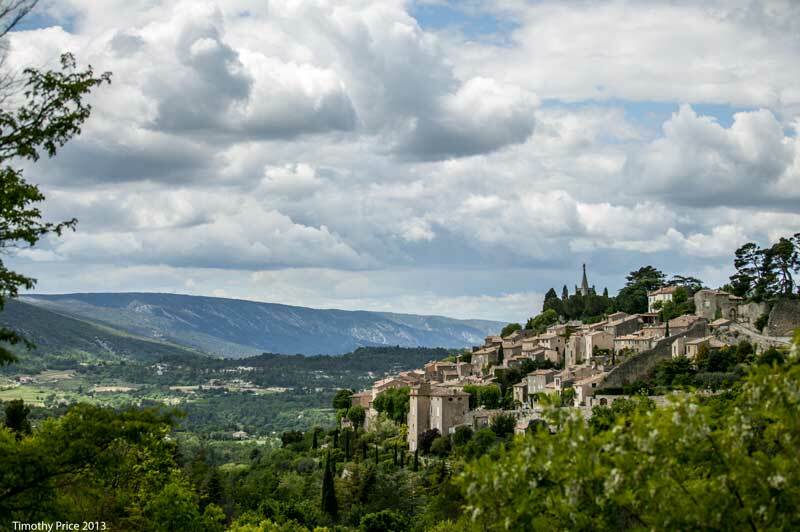 Gordes is an amazingly beautiful village built on and in the rocks on the side of a hill. After Gordes we visited Fontaine du Vaucluse, which is a headwater, but instead of a trickle of water from a melting snow pack that eventually turns into a river, Fontaine du Vaucluse produces volumes of water gushing from a spring. Parking was expensive, so we didn’t stop and get photos. 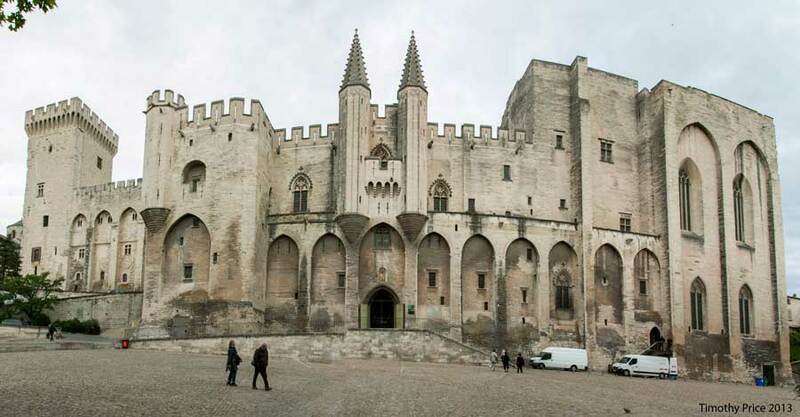 After almost seven hours visiting , we made it to Avignon. 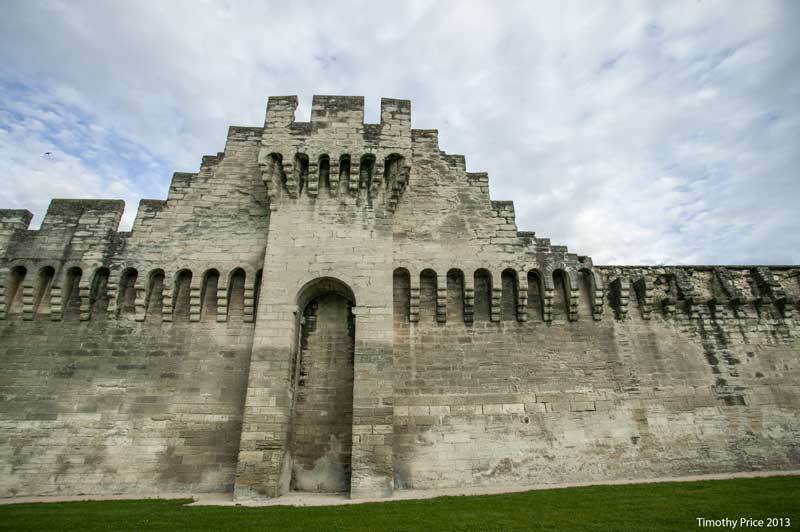 Avignon is a large city, so it takes a bit of driving to get to the old city still surrounded by a wall. 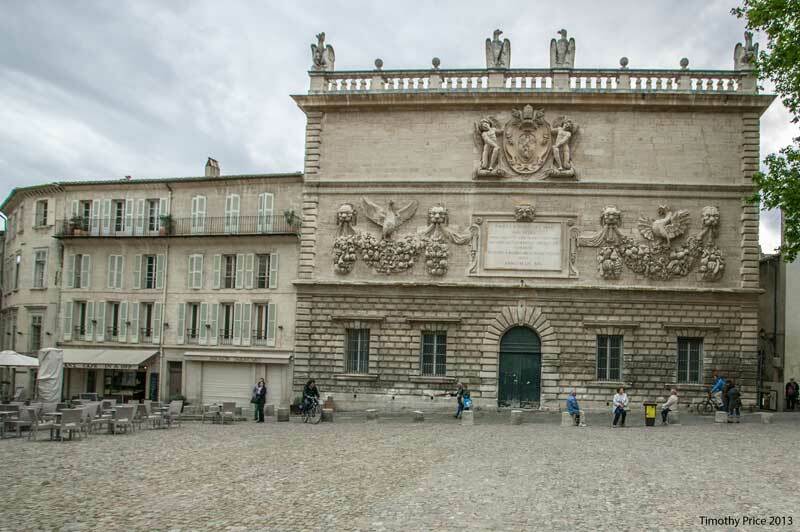 The Papal Palace is quite an imposing structure, a very well fortified building. like the cheese pic & the B&W work. happy travels. 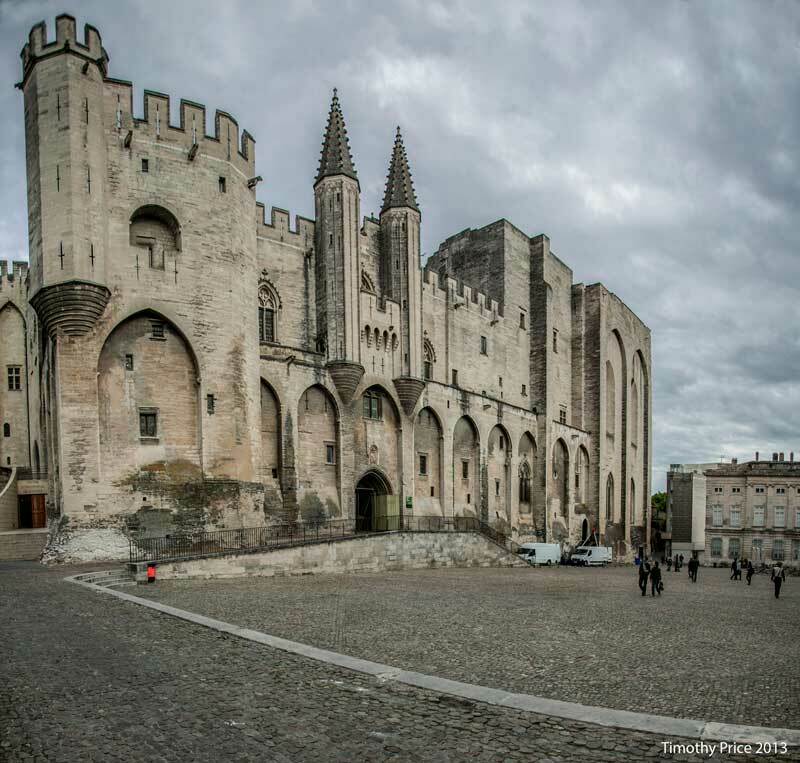 Travelled France in my youth (stone age…) and remember well the Avignon area – lovely captured. 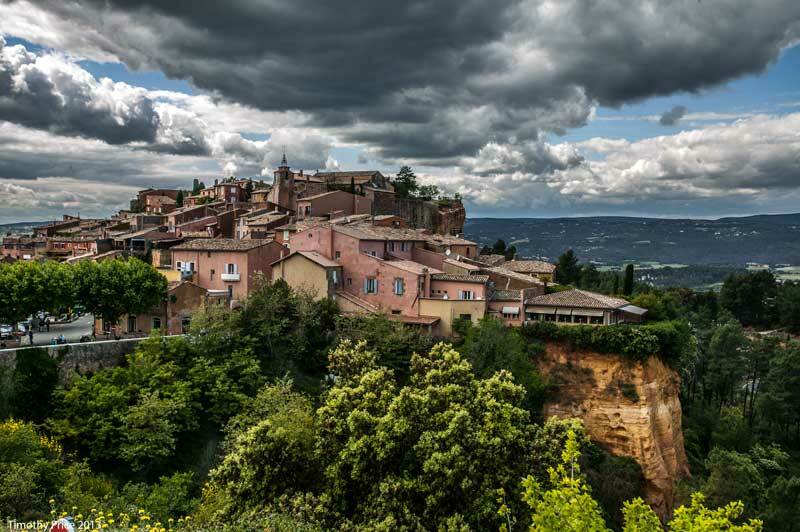 My wife was in France with her aunt and uncle when she was 15, then we drove across southern France on our way to and from Macerata, Italy when we lived in Madrid in 1997. We wanted to spend more time in France. It took 16 yours to get back, but we finally made it. Also, I’ve been putting up photos of France since we got back. If you search for France, Paris, Provence in the Search on the top right of my blog page it will find photos I’ve been posting since we got back. And France!!! You sure have seen some beauty! I have never seen a castle I can imagine something like these would be one of those moments when you are in awe! Thanks, Michelle. We saw lots more castles in Spain than in France, but any place you find them, castles are awesome. Well you are luck to have traveled like this. I’m envious. Your photos are like taking a virtual trip. So amazing. Do you mind if I share your blog with my friend Belinda @ busymindthinking.com? She is home bound and very ill and would love to see your photos. 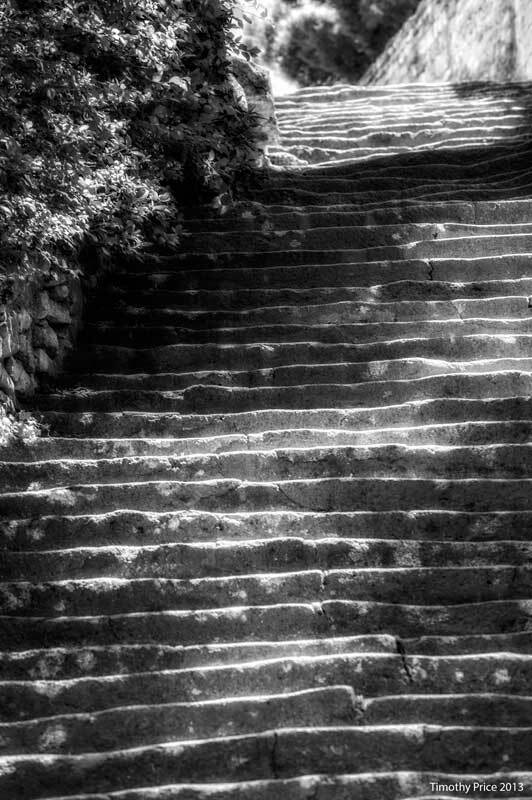 She loves to take trips in her mind via photos! I know she would love your photos as much as I do. My blog is open to the public. Please share it with her. I have another follower who is very ill and emailed me that my blog is therapeutic for him. He lives in the Netherlands. Belinda lives in Canada! She’s like one of my closest friends. We text and talk on the phone and of course blog together. It’s really nice! I recently told one of my artist friends about these blogs and he said you realize Michelle you are touching people’s lives all over the world that never get to leave their homes. I never thought of it that way before but you really never know who will read and be encouraged and also what others find interesting. Really neat I think!